Qualcomm is no stranger to legal action, but at the end of the day, you've gotta hit 'em in the pocketbook if you want to get a company to change its ways. South Korea's antitrust authorities have decided that the wireless chipmaker is guilty of some nefarious deeds, imposing a 260 billion won fine -- that's 26 with ten zeroes after it -- or about $209 million, which is a new record for the agency. The company has a rather large operation in South Korea dealing with giants Samsung and LG, and that seems to be where the problem starts -- South Korea claims that they're offering better contracts to companies who deal exclusively with Qualcomm and shun its competitors, which the government is taking issue with. For its part, Qualcomm denies any wrongdoing and is vowing to "vigorously" defend itself as it works its way through the country's court system. Whatever, we just want cheaper phones, you know? 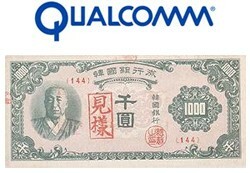 South Korea slaps Qualcomm with massive fine for anticompetitive behavior originally appeared on Engadget Mobile on Thu, 23 Jul 2009 15:48:00 EST. Please see our terms for use of feeds.